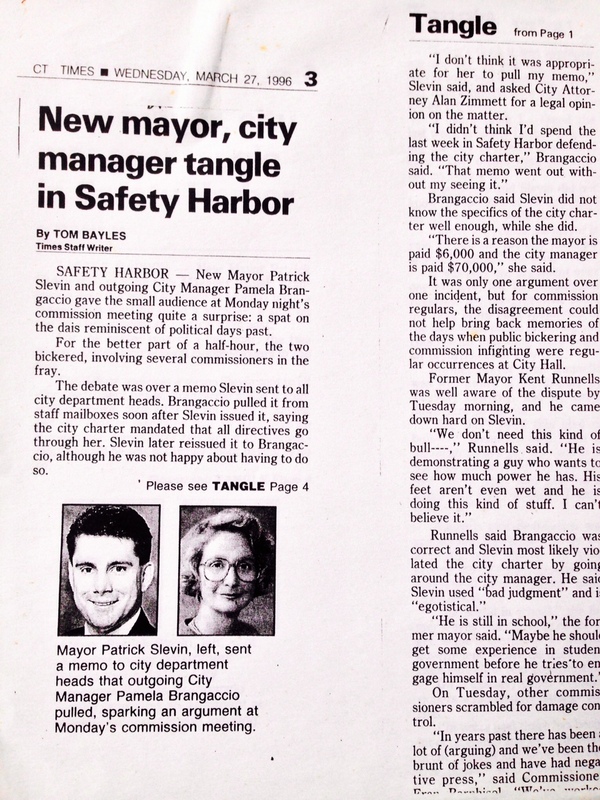 I learned public relations the hard way the day the city clerk informed me that I would become the youngest mayor in the history of Safety Harbor, Florida, at 27. Within a few hours of learning the news, I was mobbed by reporters from the St. Petersburg Times, Tampa Tribune and television news crews from ABC, CBS, NBC and Fox. I wasn’t prepared to encounter this level of media interest. And it showed!!! I did everything wrong from a PR standpoint. I answered with yes and no responses, I repeated negatives, and I naively trusted the reporters. 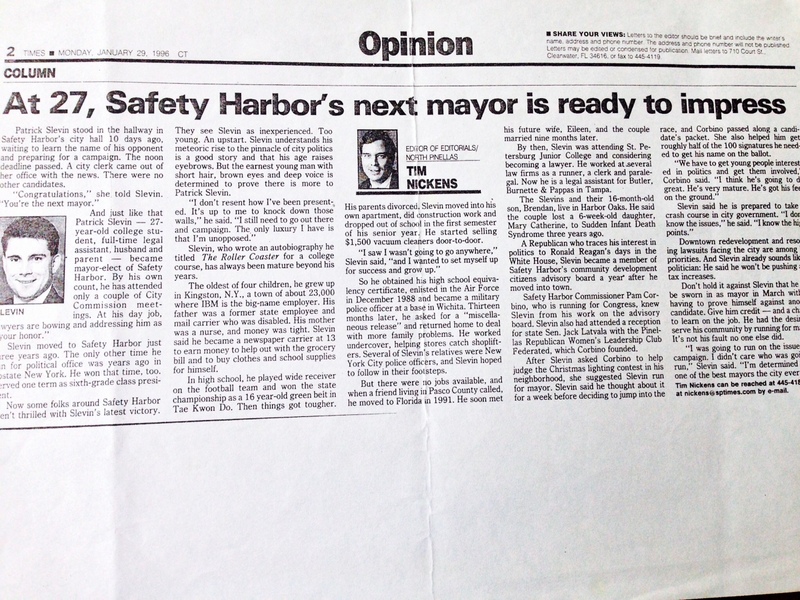 I would become the youngest GOP mayor in the nation, I was youngest mayor in Safety Harbor’s history and I was first time candidate who was unopposed. So what was wrong with the news story? 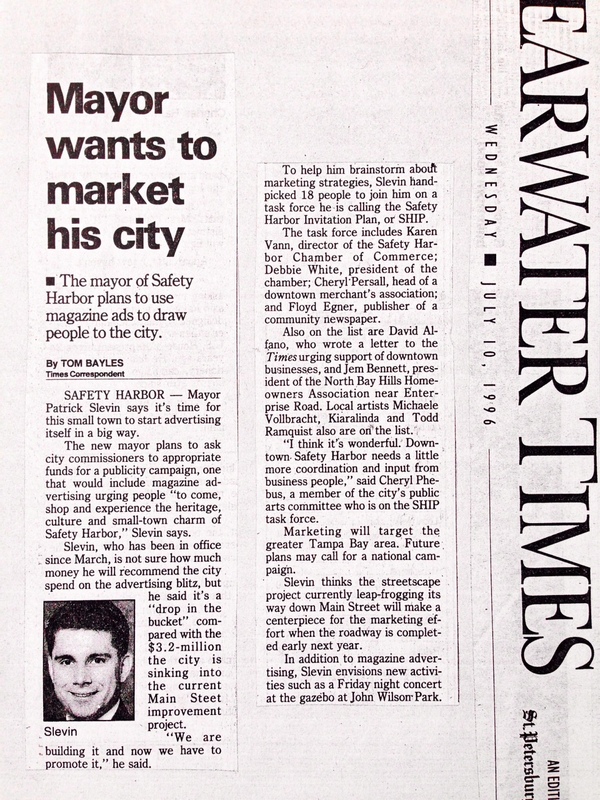 First, Safety Harbor is an upscale bedroom community located on the bay not known for any commercial fishing. 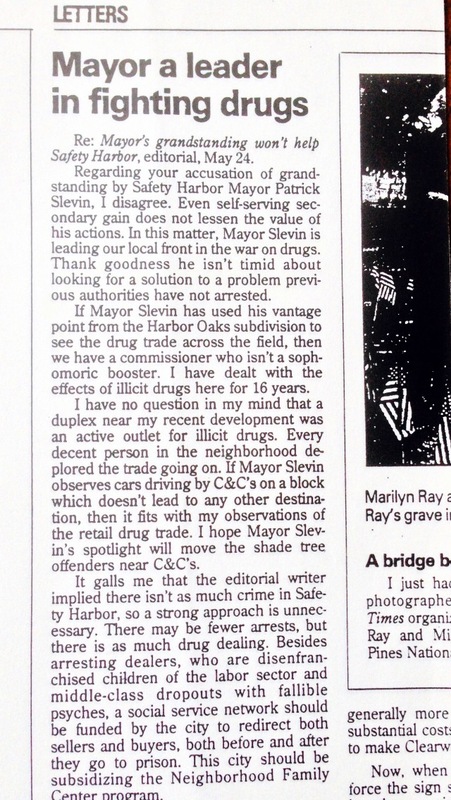 Second, the reporter lived in Safety Harbor and wasn’t thrilled about having a Generation X-GOP mayor. 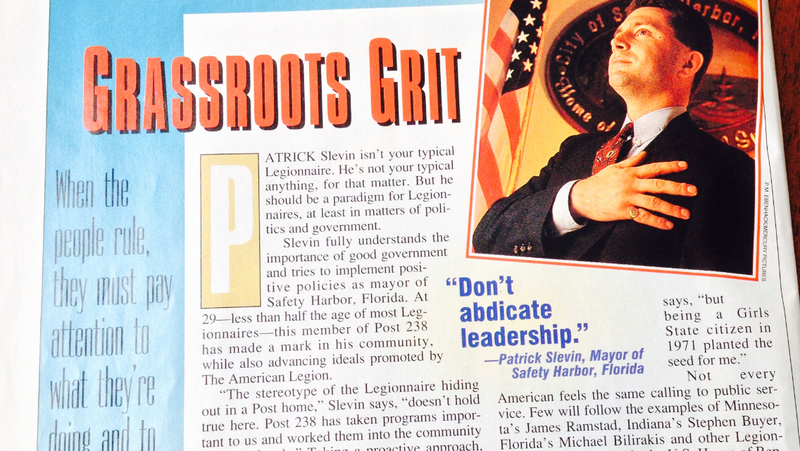 Third, I simply allowed myself be portrayed as a schmuck before millions of Floridians and worst yet, I failed my first attempt to be an effective spokesman on behalf of my nearly 20,000 new constituents. After the weekend news cycle died off, I evaluated my poor performance as a public official and politician. 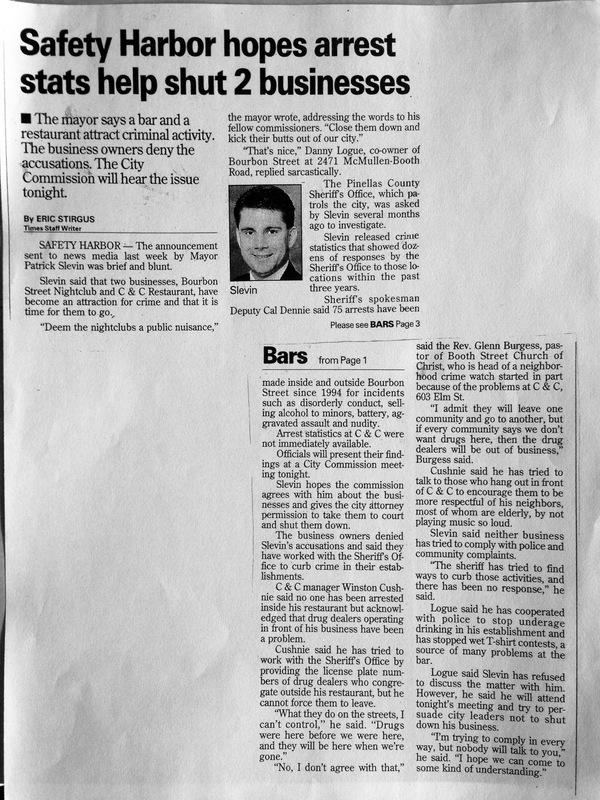 I quickly determined I must learn how to master public relations before I was sworn into office 60 days later. So, I devoured the latest PR books, talked to other public officials, studied political communications and met with local beat reporters. SKETCH ARTISTS: Reporters are not painters, they’re sketch artists. They require fast, bite size narratives and facts. The nature of their work and the pressures of deadlines prevents reporters from obtaining deep knowledge about your issue. The earlier you provide your messaging and supporting facts, which are often times presented in press releases, statements, media kits, press conferences and briefings, the better the odds of framing the story to your benefit. The easier you can make their job, the better relationships you will forge, while ensuring accuracy in reporting. THICK SKIN: If you’re not being criticized, then you’re not doing your job. As a public official, I learned that media thrives on controversy. Conflict sells papers. 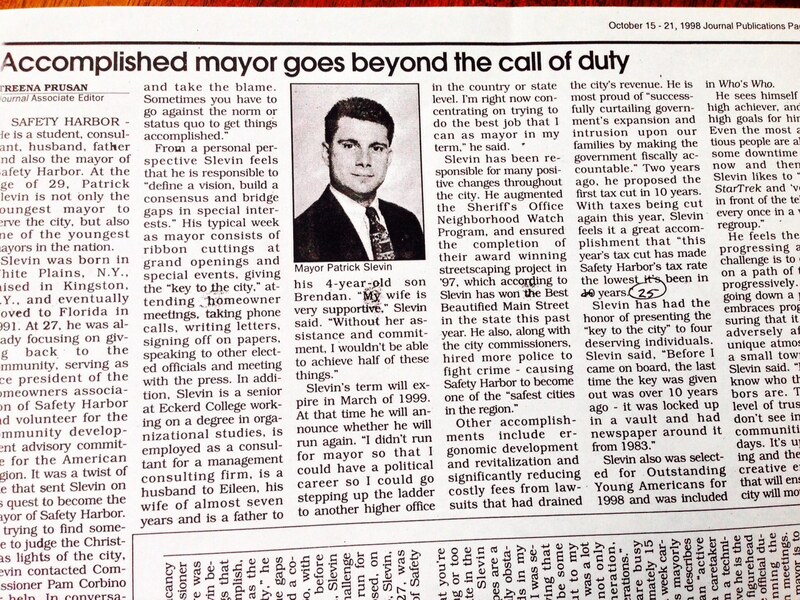 As an active mayor with a vision and purpose, I attracted more than my fair share of criticism in the media. When political opponents and editorial writers attack, you must have a thick skin and unwavering resolve in pursuing your goals. ALL PR IS LOCAL: In every community there still exists the “Proverbial Barbershop”, where thought leaders influence the behavior of voters, consumers and constituents. Local markets and community intersections are the infrastructure building any national platform delivering integrated communications focused on recruiting, influencing and mobilizing stakeholders. More people listen to their community leaders who influence where they eat, what they buy and who they should vote for on Election Day, than any news story in the New York Times or USA Today. HUMANIZE THE STORY: Emotion trumps logic when influencing the opinions, behavior and attitudes of audiences. For corporations, associations, and special interest groups it’s not what you say, but who says it for you. 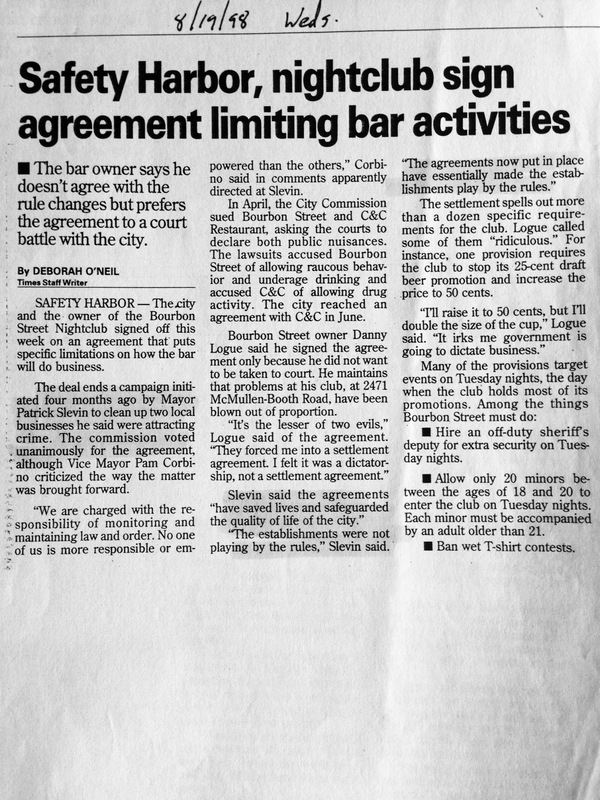 My campaign as mayor to sue and close two establishments in Safety Harbor did not have the support of the city commission. 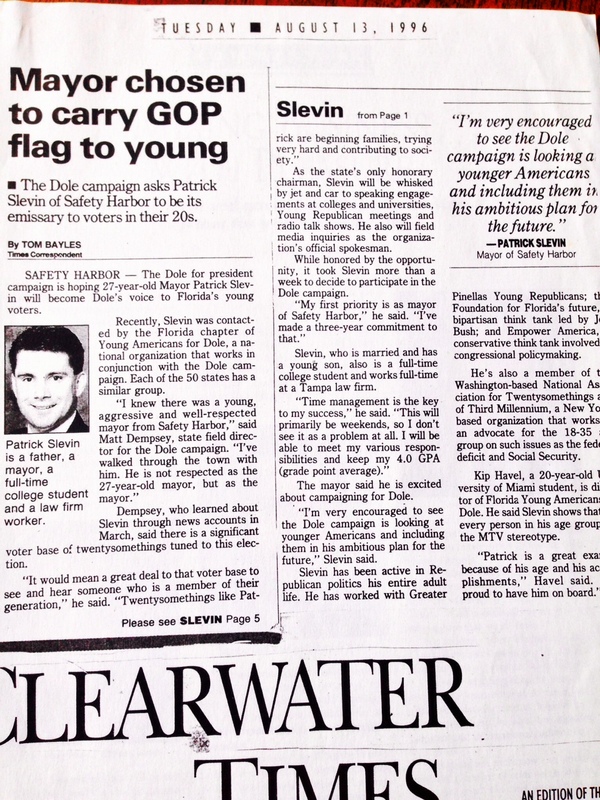 Unfortunately, my go-getter attitude created the appearance of being unilateral, when in fact I was representing hundreds of affected constituents. This is where I learned the value and impact of surrogates and putting a face on an issue to help educate key stakeholders. 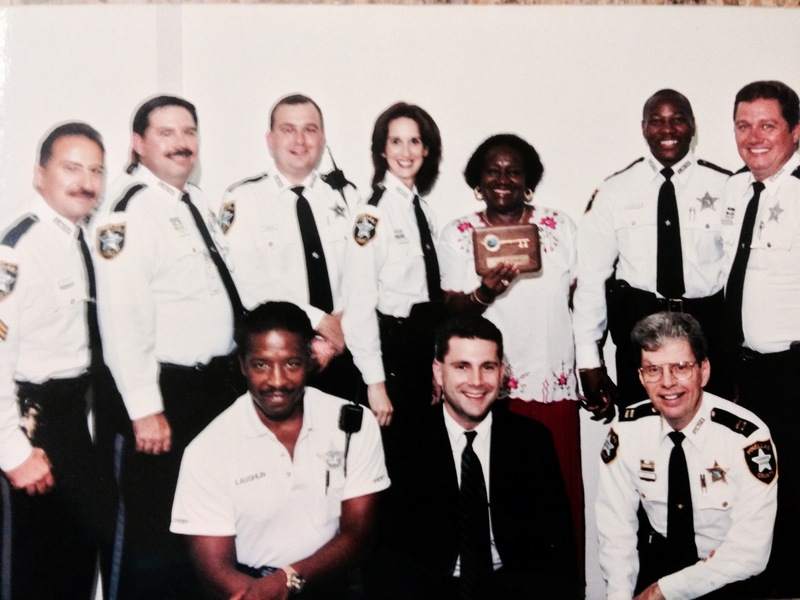 After setting up a neighborhood watch and partnering with the sheriff’s office, the effort to close the establishments was championed by Safety Harbor residents. 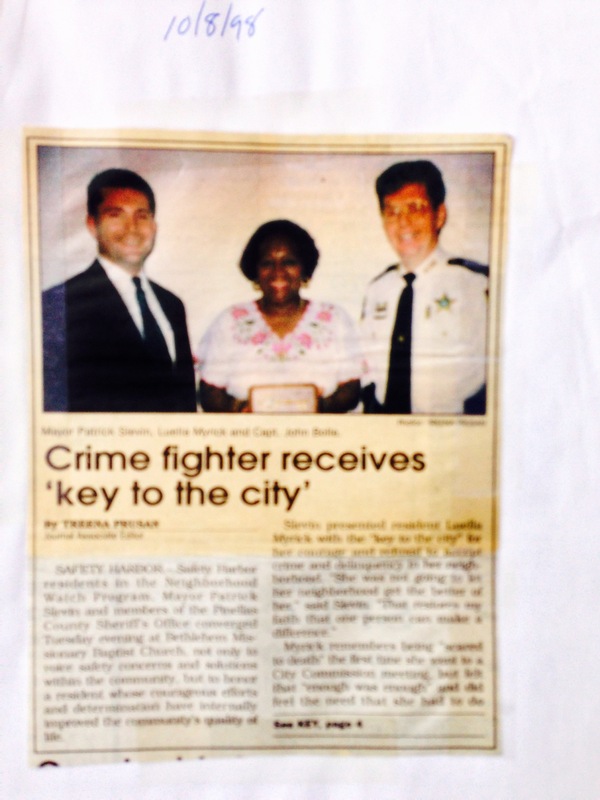 Several would receive Keys to the City. 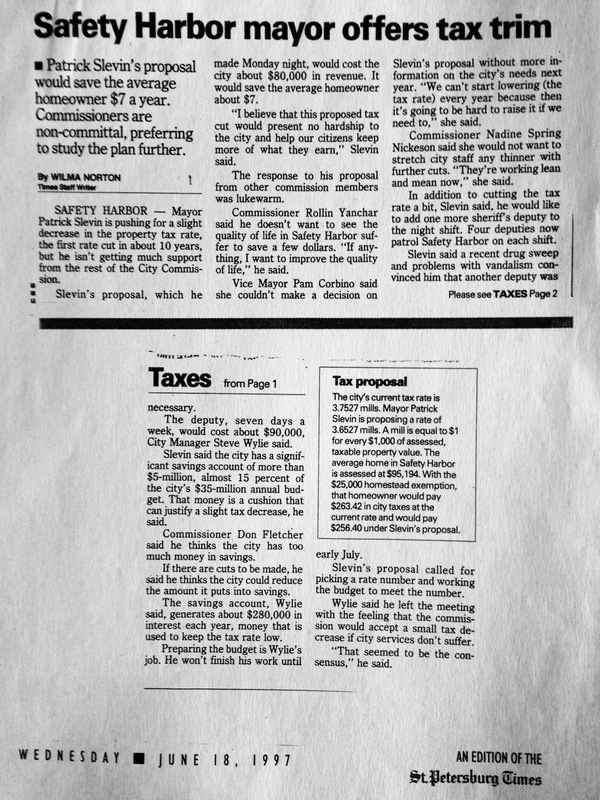 When the time came to vote, city hall was overflowing into the street with angry and concerned residents. Residents, mostly African American women, shared their personal stories of drug dealers, crime and concerns for their children. 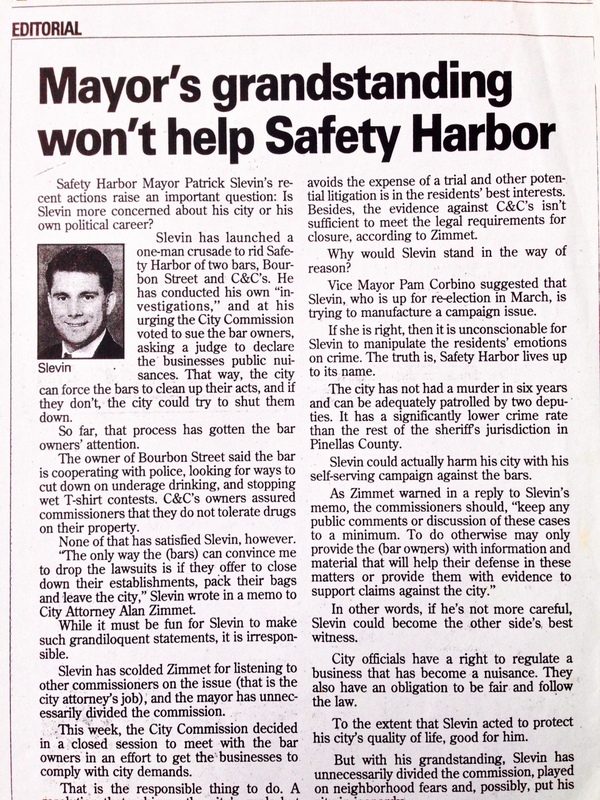 What started out as a 4-1 vote against suing, turned into 5-0 vote for lawsuits to protect the citizens of Safety Harbor. LEADERSHIP: Leadership must have vision, strategy, fortitude and inspiration. Public relations affirms leadership by defining the big picture, justifying risk, and most importantly, motivating stakeholders. 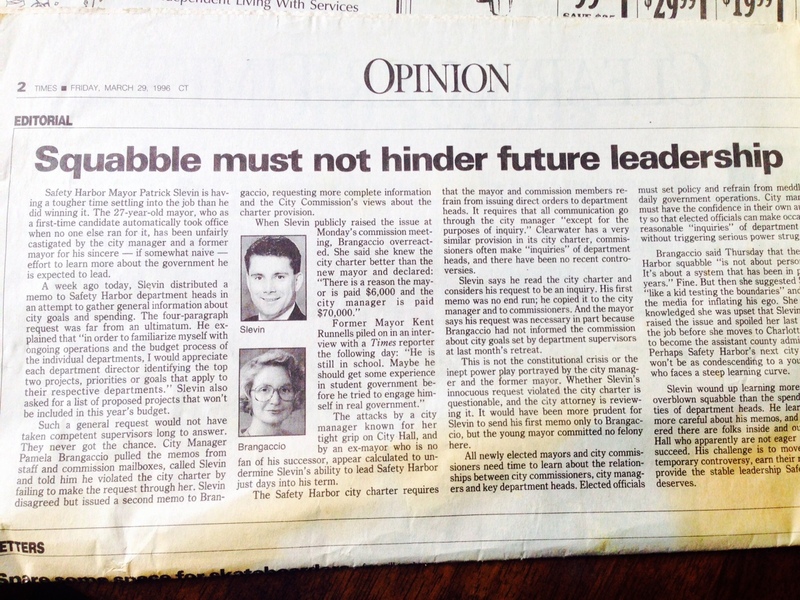 As mayor, it became apparent that the biggest threat to my city’s progress and future prosperity was status quo attitudes. Any C-Suite executive would agree that protecting the status quo is not an effective strategy, but the equivalent to organizational and market share atrophy or suicide. Therefore, a leader must be an effective change agent and communicator in allaying the fears of change. A leader must be able to articulate and address the self-interests of his/her employees, partners, shareholders, constituents, voters and media. 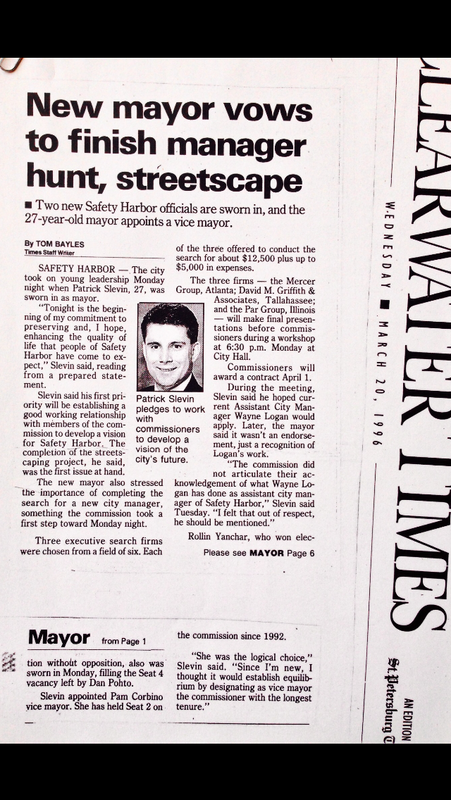 It was a honor to represent the people of Safety Harbor. 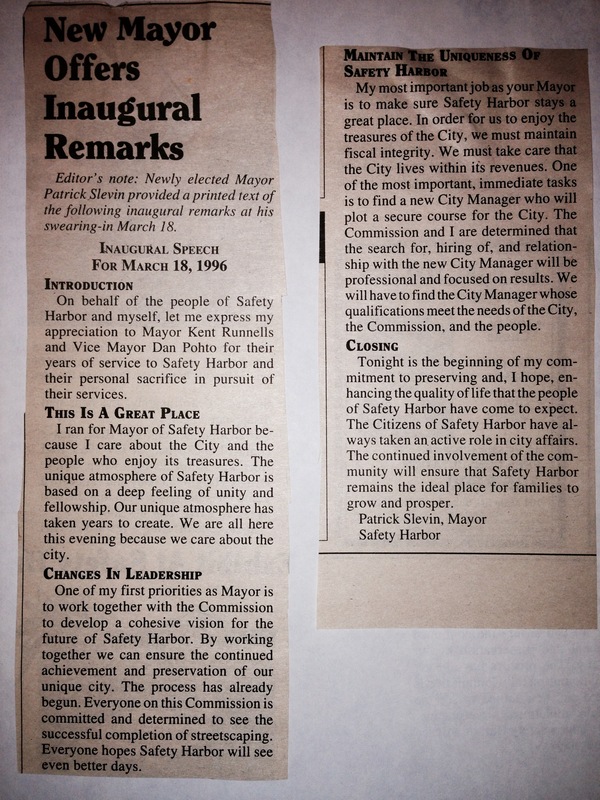 When I left office in 1999, I decided to pursue a career in public relations. Everyone has a story to tell. 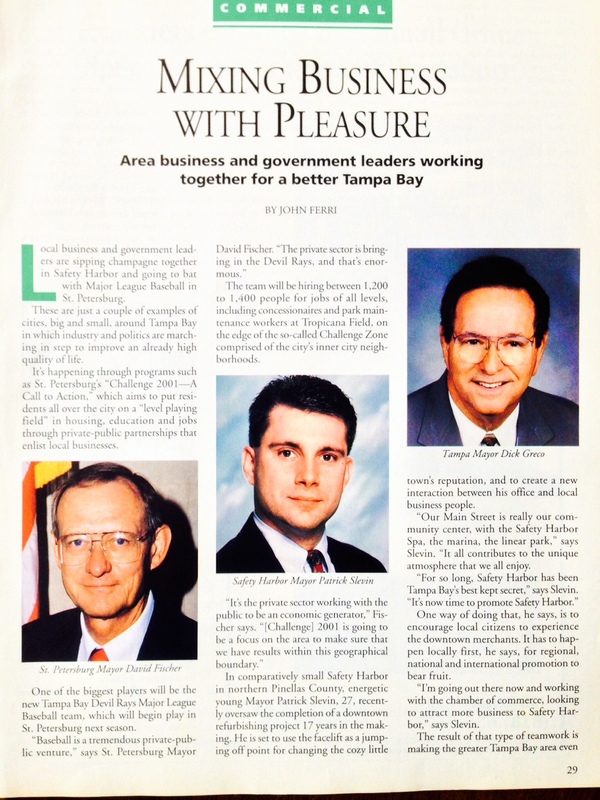 My experience as mayor so many years ago, gives my clients, to this day, a unique perspective underwriting successful programs, campaigns and initiatives across Florida and across the nation. I have the privilege of telling their stories to the audiences that impact their bottom-line priorities.